The founder of the Latter Day Saint movement was Joseph Smith, and to a lesser extent, during the movement's first two years, Oliver Cowdery. Throughout his life, Smith told of an experience he had as a boy having seen God the Father and Jesus Christ as two separate beings, who told him that the true church of Jesus Christ had been lost and would be restored through him, and that he would be given the authority to organize and lead the true Church of Christ. Smith and Cowdery also explained that the angels John the Baptist, Peter, James, and John visited them in 1829 and gave them priesthood authority to reestablish the Church of Christ. The first Latter Day Saint church was formed on April 6, 1830, consisting of a community of believers in the western New York towns of Fayette, Manchester, and Colesville. The church was formally organized under the name of the "Church of Christ". By 1834, the church was referred to as the "Church of the Latter Day Saints" in early church publications, and in 1838 Smith announced that he had received a revelation from God that officially changed the name to the "Church of Jesus Christ of Latter Day Saints". In 1844, William Law and several other Latter Day Saints in church leadership positions publicly denounced Smith's secret practice of polygamy in the Nauvoo Expositor, and formed their own church. The city council of Nauvoo, Illinois, led by Smith, subsequently had the printing press of the Expositor destroyed. In spite of Smith's later offer to pay damages for destroyed property, critics of Smith and the church considered the destruction heavy-handed. Some called for the Latter Day Saints to be either expelled or destroyed. Joseph Smith and his brother Hyrum, the Assistant President of the Church, were both assassinated by a mob while in a Carthage, Illinois jail, and several bodies within the church claimed to be the senior surviving authority and appointed successors. These various claims resulted in a succession crisis. Many supported Brigham Young, the President of the Quorum of the Twelve Apostles; others Sidney Rigdon, the senior surviving member of the First Presidency. Emma Hale Smith failed to persuade William Marks, the president of the Presiding High Council and a Rigdon supporter, to assume leadership and the surviving members of Smith's immediate family remained unaffiliated with any larger body until 1860, when they formed the Reorganized Church of Jesus Christ of Latter Day Saints with Joseph's eldest son as prophet. These various groups are sometimes referred to under two geographical headings: "Prairie Saints" (those that remained in the Midwest United States); and "Rocky Mountain Saints" (those who followed Young to what would later become the state of Utah). Today, the vast majority (over 98 percent) of Latter Day Saints belong to The Church of Jesus Christ of Latter-day Saints (LDS Church), which reports over 16 million members worldwide. The second-largest denomination is the Missouri-based Community of Christ (formerly the Reorganized Church of Jesus Christ of Latter Day Saints) which reports over 250,000 members. Small denominations that trace their origins to Rigdon, James Strang, or other associates of Smith's still exist, and several fundamentalist sects which separated from the Utah LDS Church after it rejected plural marriage in 1890 claim tens of thousands of members. 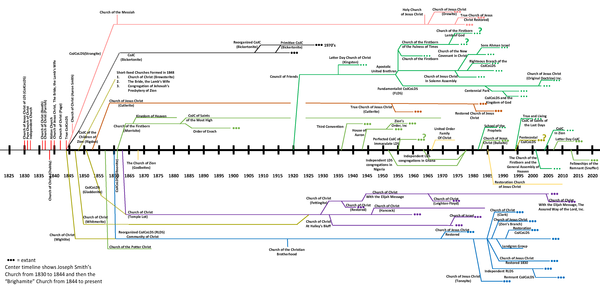 Historically, the different denominations within the Latter Day Saint movement have been hostile towards or dismissive of one another; this is largely because each group claims to be the sole legitimate continuation of the one true church established by Smith in 1830. Latter Day Saints adopt a definition of "saint" that all members of the church are considered "Saints". The term "latter day" distinguishes between biblical saints and modern saints who "live in the latter days". The Latter Day Saint movement classifies itself within Christianity, but as a distinct restored dispensation. Latter Day Saints hold that a Great Apostasy began in Christianity not long after the ascension of Jesus Christ, marked with the corruption of Christian doctrine by Greek and other philosophies, and followers dividing into different ideological groups. Additionally, Latter Day Saints claim the martyrdom of the apostles led to a loss of priesthood authority to administer the church and its ordinances. According to Latter Day Saint churches, God re-established the early Christian church as found in the New Testament through Joseph Smith. In particular, Latter Day Saints believe that angels such as Peter, James, John, and John the Baptist appeared to Smith and others and bestowed various priesthood authorities on them. Thus, Smith and his successors are considered modern prophets who receive revelation from God to guide the church. Most members of Latter Day Saint churches are adherents to Mormonism, a theology based on Joseph Smith's later teachings and further developed by Brigham Young, James Strang and others who claimed to be Smith's successors. 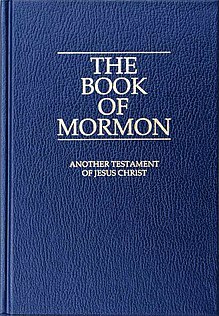 The term "Mormon" derives from the Book of Mormon, and most of these adherents refer to themselves as Latter Day Saints or Mormons. Mormonism and Christianity have a complex theological, historical, and sociological relationship. Mormons express the doctrines of Mormonism using standard biblical terminology, and claim to have similar views about the nature of Jesus' atonement, resurrection, and Second Coming as traditional Christianity. Nevertheless, Mormons agree with non-Mormons that their view of God is significantly different from the trinitarian view of the Nicene Creed of the 4th century. Mormons consider the Bible as scripture and have also adopted additional scriptures. Mormons not only practice baptism and celebrate the eucharist but also participate in religious rituals not practiced in traditional Christianity. Although the various branches of Christianity have diverse views about the nature of salvation, the Mormon view is particularly distinct. Focusing on differences, some Christians consider Mormonism "non-Christian"; members of the LDS Church, focusing on similarities, are offended at being so characterized. Mormons do not accept non-Mormon baptism. Mormons regularly proselytize individuals actually or nominally within the Christian tradition, and some Christians, especially evangelicals, proselytize Mormons. The LDS Church has a formal missionary program with nearly 70,000 missionaries, 15 training centers worldwide, and 407 missions worldwide. A prominent scholarly view is that Mormonism is a form of Christianity, but is distinct enough from traditional Christianity so as to form a new religious tradition, much as Christianity has roots in but is a distinct religion from Judaism. The Mormonism that originated with Smith in the 1820s shared strong similarities with some elements of 19th-century Protestant Christianity including the necessity of baptism, emphasis on family, and central doctrine on Christ as a means to salvation. However, beginning with his accounts of the First Vision in the 1830s and 1840s, Smith—who said that Christ had told him not to join any existing church—departed significantly from traditional Christianity, claiming all churches of his day were part of a Great Apostasy that had lost the authority to direct Christ's church. Mormonism does not characterize itself as a Protestant religion, as Smith taught that he had received revelation direct from Christ to restore his original church. Mormons believe that God, through Smith and his successors, restored these truths and doctrinal clarifications, and, initiating a new heavenly dispensation, restored the original church and Christianity taught by Jesus. For example, Smith rejected the Nicene doctrine of the Trinity as of one body and substance, with no "body, parts, or passions", and instead taught that the Godhead included God, the Eternal Father, also known as Elohim; his only-begotten son in the flesh, Jesus Christ, also known as Jehovah, the savior and redeemer of the world; and the Holy Ghost or Holy Spirit, an individual personage of spirit whose influence can be felt in many places at once. Further, Smith taught that the essence of all humans is co-eternal with God and that humans, as the spirit offspring of God the Father, have the potential to become like God. The Church of Jesus Christ of Latter-day Saints (LDS Church), the largest Mormon denomination, while acknowledging its differences with mainstream Christianity, often focuses on its commonalities, which are many, the most important of which is that Christ is the savior of the world and that he suffered for the world's sins so that the penitent can return to live in heaven. A small fraction of Latter Day Saints, most notably those within the Community of Christ, the second largest Latter Day Saint denomination, follow a traditional Protestant theology. The Community of Christ views God in trinitarian terms, and reject the distinctive theological developments they believe to have been developed later in Mormonism. ^ Shields, Steven L. (2012). "Proposing an Academic Name for the Movement". Restoration Studies. 13: 47–60. ISBN 9781934901830. ^ "15 Million Member Milestone Announced at LDS Church Conference". www.mormonnewsroom.org. ^ Russell, William D. (Winter 2005). "An RLDS Schismatic Group Finds a Prophet of Joseph's Seed" (PDF). Dialogue: A Journal of Mormon Thought. 38 (3). ^ Manuscript History of the Church, LDS Church Archives, book A-1, p. 37; reproduced in Dean C. Jessee(comp.) (1989). The Papers of Joseph Smith: Autobiographical and Historical Writings(Salt Lake City, Utah: Deseret Book) 1:302–303. ^ Hales, Brian C. (2007). Modern Polygamy and Mormon Fundamentalism: The Generations After the Manifesto. John Whitmer Historical Association. ISBN 1-58958-035-4. ^ See, e.g., Joseph Smith (ed), Doctrine and Covenants of the Church of the Latter Day Saints (Kirtland, Ohio: F. G. Williams & Co., 1835). ^ "LDS Statistics and Church Facts | Total Church Membership". www.mormonnewsroom.org. Retrieved 2018-10-17. ^ The term "Mormon fundamentalist" appears to have been coined in the 1940s by apostle Mark E. Petersen: Ken Driggs, "'This Will Someday Be the Head and Not the Tail of the Church': A History of the Mormon Fundamentalists at Short Creek", Journal of Church and State 43:49 (2001) at p. 51. ^ Quentin L. Cook, "Are You a Saint? ", Ensign, November 2003, pp. 95–96. ^ Talmage, James E. (1909). The Great Apostasy. The Deseret News. pp. 64–65. ISBN 0-87579-843-8. ^ Richards, LeGrand (1976). A Marvelous Work and a Wonder. Deseret Book Company. p. 24. ISBN 0-87747-161-4. ^ Talmage, James E. (1909). The Great Apostasy. The Deseret News. p. 68. ISBN 0-87579-843-8. ^ There are a number of books by evangelical Christians that explain how evangelicals can approach witnessing to Mormons: e.g., David L. Rowe (2005). I Love Mormons: A New Way to Share Christ with Latter-day Saints (Baker Books, ISBN 978-0-8010-6522-4); Ron Rhodes (2001). The 10 Most Important Things You Can Say to a Mormon (Harvest House, ISBN 978-0-7369-0534-3); Mark J. Cares (1998). Speaking the Truth in Love to Mormons (Wels Outreach Resources, ISBN 978-1-893702-06-6). ^ "LDS News | Mormon News - Official Newsroom of the Church". www.mormonnewsroom.org. Retrieved 2018-10-17.